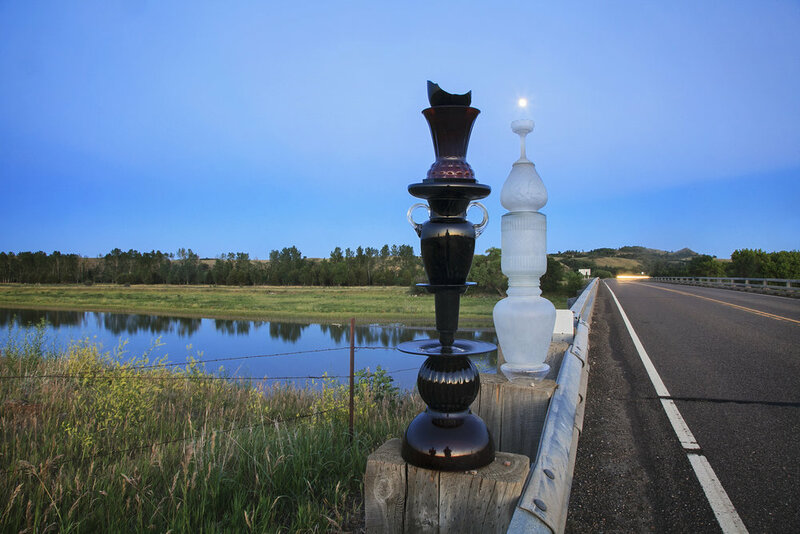 Artists Libby Reuter and Joshua Rowan create Watershed Cairns: Water Marked with Art throughout the Mississippi/ Missouri river basin. 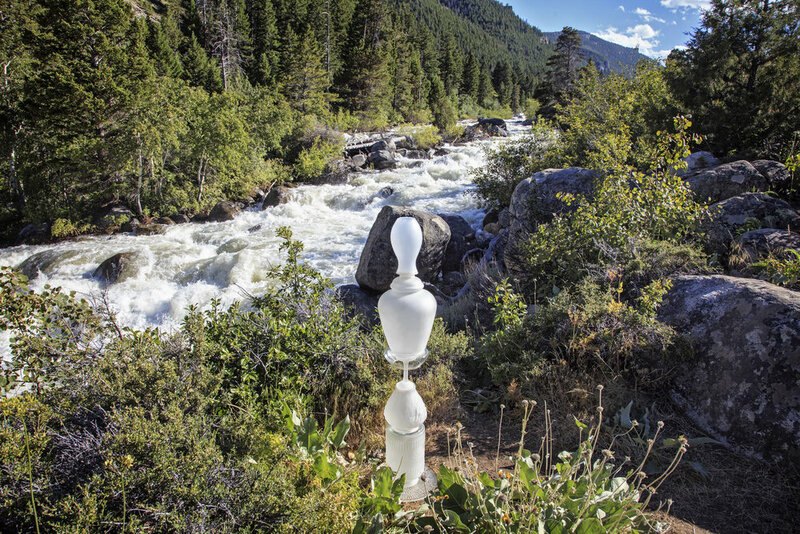 They temporarily place and photograph found-glass sculptures, or cairns, to draw attention to fresh water on land ,streams, and rivers. 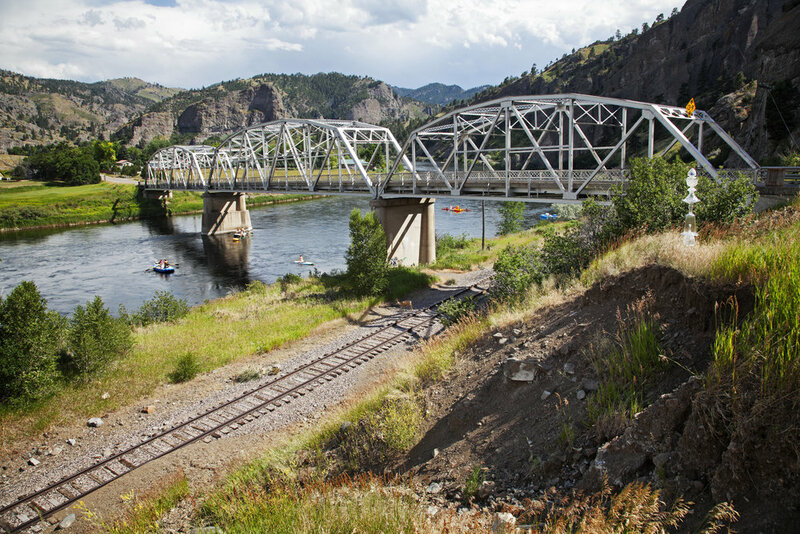 These images mark Missouri River’s path from the Centennial Mountains in Montana into North Dakota. The journey continues in Missouri River 2, following the Missouri to its confluence with the Mississippi River north of St. Louis, Missouri. The Crystal cairn reflects the setting sun at the edge of the First Peoples Buffalo Jump State Park, northwest of the Missouri River. The steel truss bridge spanning the Missouri River on old US Route 91 is listed on the National Register of Historic Places in 2010. The Green-gold cairn is resting in a campground between Pray Lake and the larger Two Medicine Lake. This cairn marks the Continental Divide, the high places where water on different sides of the mountain flow in two distinct watersheds. 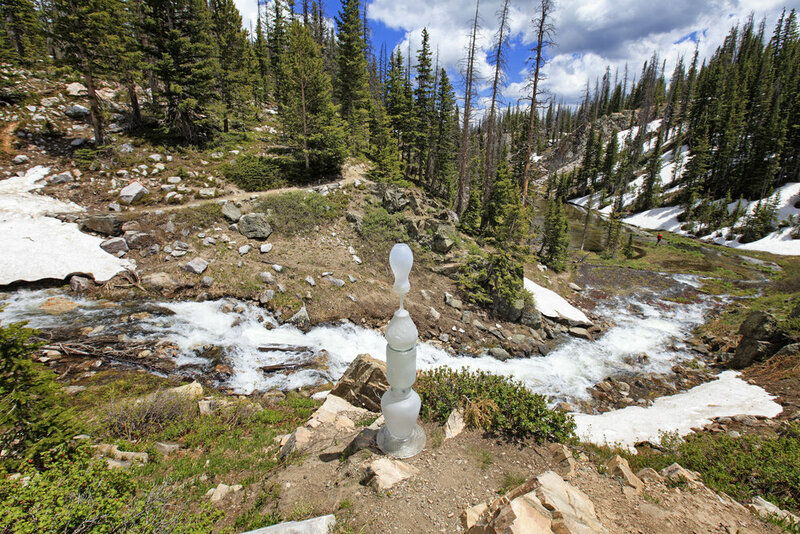 This cairn marks the Continental Divide, the high places where water on different sides of the mountain flow in two distinct watersheds, or basins. This cairn sits on the Lewis and Clark Trail. Not an actual road, but a series of historical markers based on the journals that Meriwether Louis and William Clark kept of their journey to explore the new Louisiana Territory and find a route to the Pacific Ocean in the early 1800s This site is about 15 miles downstream from where the Maria’s River, a major tributary, enters the Missouri River. This cairn stands on private property near the confluence of the Teton and Maria’s rivers in the National Wild and Scenic Rivers area. 47°44’18”N 109°37’33”W[WR1] —Elevation 2,400 ft.
On the Judith River, looking east. A six-foot-tall, white glass cairn stands on the loading dock of an old wooden grain elevator. This image was created after the fire in the Little Rocky Mountains had been burning for 19 hours. It would burn for days and consume 10,000 acres. The red glow of the forests burning in the Little Rocky Mountains is the backdrop for a glowing white cairn. Captain Meriwether Lewis, of the Lewis and Clark Expedition, wrote, “From the colour of its water we called it Milk river." A 5-gallon jug is partially submerged in the slick, muddy water of the Milk River. 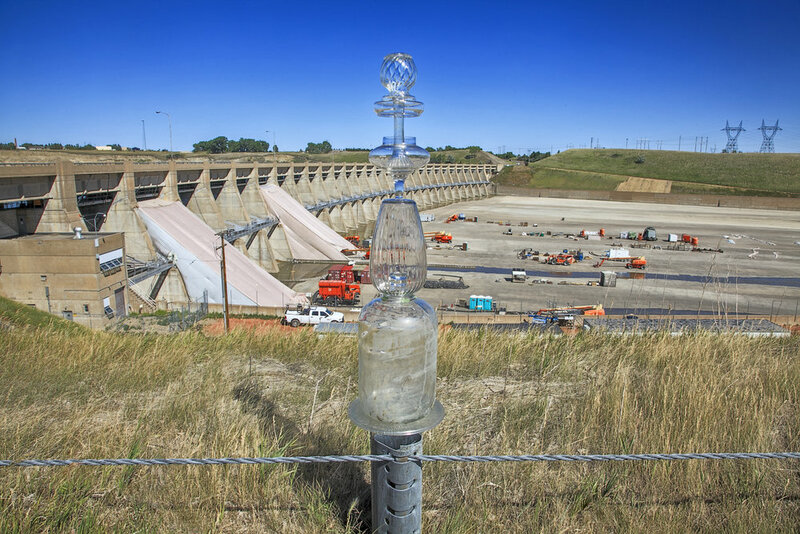 The Crystal cairn overlooks the Yellowstone River near a bridge at Cartwright, North Dakota, just a few miles upstream from its confluence with the Missouri River. Oil rigs and refineries are common throughout North Dakota. The field of yellow canola flowers on Highway 37 near Parshall, North Dakota, makes a joyous setting for the Geen-gold cairn. The waterless spillway of the fourth largest earthen dam on the planet is indicative of how dry 2017 was in the American West. The False Gods cairn and the Lantern cairn face each other near the No Dakota Access Pipeline protest site. The stream flowing below this cairn empties into the North Platte River, just west of the Medicine Bow National Forest. The Platte is a major tributary of the Missouri River. An entire side of the mountain behind this translucent cairn is covered with dead Lodgepole pines. The black glass cairn named “False Gods” sits balanced in the melting snow and ice. Water from this pond drains into nearby Libby Creek, and later into the North Platte River, then the Platte River, which is a major tributary of the Missouri River. The Lantern Cairn sits balanced on a bolder in the middle of the Douglas River while fly fishermen wait for their turn at this fishing hole. Cairns are often used as memorials as well as trail markers. Here, the lantern cairn is a memorial to Ryan O’Malley’s mother. The Popo Agie River disappears (sinks) on one side of the mountain, and reappears here. The Pilot Butte Reservoir on the Wind River provides water for irrigation. Bluffs along Sinks Canyon Road, south of Lander, Wyoming, provide the background for this green and gold cairn. 43°58’36”N 110°39’24”W— Elevation 6,860 ft. The shapes of the Crystal cairn, the planes of the mountainside, and the surface of the water in Jackson Lake shimmer with reflected sunlight. The quiet, cooler side of Yellowstone National Park has fresh, clear water in small streams that feed the Yellowstone River. 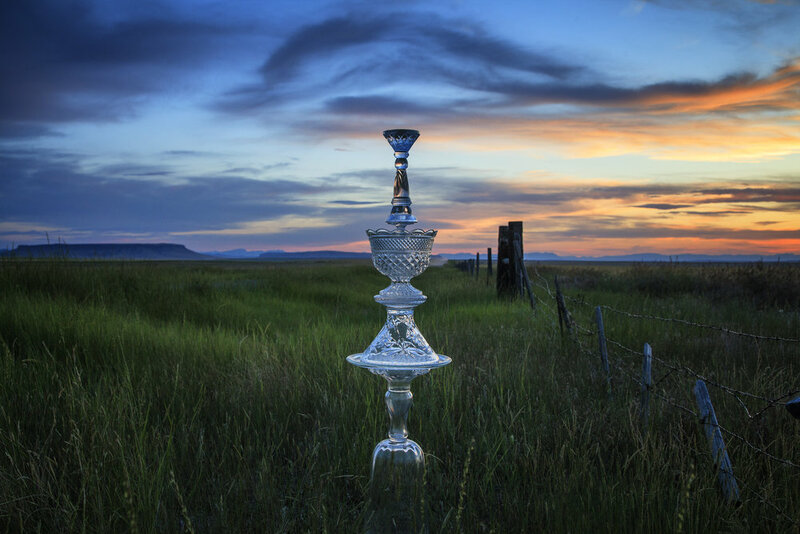 The Crystal cairn sits in a firepit next to the Buffalo Bill Reservoir on the Shoshone River. Strong winds and heavy black clouds rushed toward the cairn on the bank of the Buffalo Bill Reservoir. The Green-gold cairn is dwarfed by the iron-red bluffs in the Wild Horse Mountain Range. The Green-gold cairn is sitting on the iron-red bluffs in the Wild Horse Mountain Range. The Green-gold cairn nestles in sagebrush near the Horseshoe Bend Observation site, overlooking the Bighorn River. After a rain, horses on the Diamond Cross Ranch graze on the bank of the Tongue River. The Tongue rises in Wyoming in the Bighorn Mountains, flows through northern Wyoming and southeastern Montana, then empties into the Yellowstone River at Miles City, Montana. The Yellowstone is a major tributary of the Missouri River. The False Gods cairn stands over a stream leading to the Yellowstone River near this refinery in downtown Billings, Montana. The False Gods cairn stands in a residential street, leading to a refinery in downtown Billings, Montana. A clear cairn poses on a sandstone boulder near three caves where prehistoric hunters left drawings on the cave walls. Small, fragrant wildflowers grow at the foot of this cairn that appears to touch the sky on Beartooth Highway. An otherworldly mist envelops the False Gods cairn in the snow, 567 feet below the summit of Beartooth Pass. Clear lakes reflect a faceted crystal cairn, viewed from the Beartooth National Scenic Byways-All American Road. 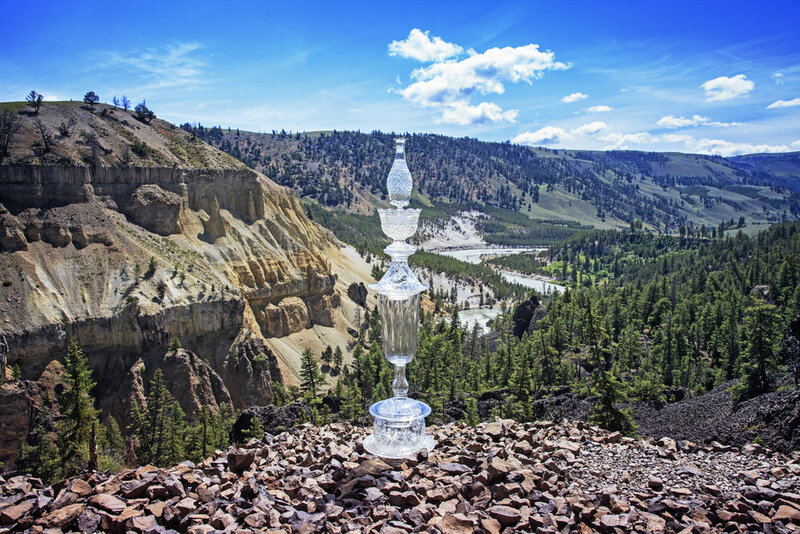 The Crystal cairn is poised on the stone wall overlooking the Yellowstone River in northeastern Yellowstone Park. The black False Gods cairn contrasts with the white limestone terraces and the colors of the heat-loving microorganisms in Yellowstone National Park. Water, flowing from the mountains in the background, becomes the Jefferson River that joins other rivers at the Missouri Headwaters State Park to become the Missouri River. The tallest cairn made on the Missouri River perches on the edge of a steep bluff overlooking the confluence of the Jefferson and Madison rivers. This cairn posed on a picnic table with a great view of the Canyon Ferry Dam and reservoir. This dam is the second of the 15 large dams on the main stem of the Missouri River.